Merseyside police say a 20-year-old man was arrested on suspicion of racially abusing the player and has since been released on bail. 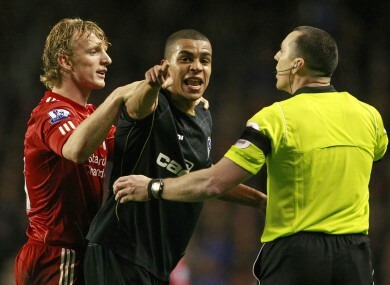 LIVERPOOL FC LAST night apologised to Oldham defender Tom Adeyemi, who says he was racially abused by a fan at Anfield during the sides’ FA Cup tie last week. A 20-year-old man was arrested on suspicion of racially abusing the player and has since been released on bail. A statement from the club reads: “Whatever the outcome of what is now a police investigation, all of us are deeply sorry for what happened on Friday night and our players and our club pass on our sincere regrets to Tom Adeyemi for the upset and distress he suffered as a result of the matter at hand. The incident occured against the backdrop of the recent tensions between Liverpool and rivals Manchester United in the wake of the Luis Suarez racism row. The Uruguayan striker is currently serving an eight-game ban for racially abusing French defender Patrice Evra in October. Email “Liverpool apologise to Oldham player Adeyemi for terrace abuse ”. Feedback on “Liverpool apologise to Oldham player Adeyemi for terrace abuse ”.